Built on a strong outdoor season during the fall, where he competed in four cross country meets…posted career-bests in both at both the 8k and 6k distances…poised for another breakthrough on the track in the 800 and possibly 1500. Lined up at Covered Bridge Open, adidas XC Challenge, FSU Invitational and Crimson Classic in his most extensive campaign to date…was eigth man at Covered Bridge and followed with a 6k personal-best (19:51.1) at adidas XC Challenge…recorded 8k PB at Crimson Classic (26:32.3). Cross Country: Saw action in two meets, highlighted by a 16th-place finish at the FSU Invitational. Indoor: competed in six meets with his top performance coming in 800 at the David Hemery Valentine Invitational, an indoor PB of 1:52.94. Outdoor: season highlight came in finale at ACC Championships where he ran a PB of 1:50.85 in the preliminary rounds…competed in five meets, including a pair of appearances on the 4×400 relay. Cross Country: Competed in one meet – the FSU Invitational – where he finished 37th…spent the fall training for the track seasons. Indoor: Saw action in five meets, competing primarily in the 800…improved in each of his first four 800s of the season, highlighted by his indoor-best 1:53.58 at the Tyson Invitational…was tripped and fell in the preliminary round of the ACC Championships…also handled the baton on a pair of 4×400 relay teams. 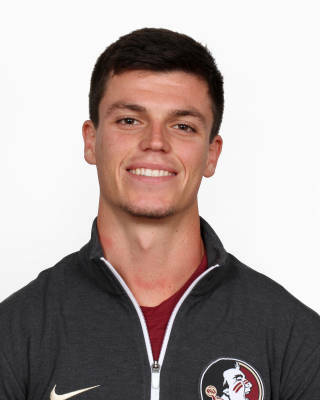 Outdoor: Enjoyed a breakthough season in the 800, beginning with his 1:51.62 at the Florida Relays…lowered his personal-best against at the University of Florida, finishing fifth at the Tom Jones Memorial (1:51.05)…shaved that time to 1:51.03 at the Longhorn Invitational…narrowly missed making the ACC Championships finals. Indoor: Added to the roster for the season as an invited walk-on…competed in the mile at the Auburn Invitational and Razorback Invitational. Outdoor: Saw action in a pair of home meets, competing in the 800…secured a future roster spot when he finished third at the Seminole Invitational in 1:52.26. Starred at Steinbrenner High, where he set school records in the 800, 1600, 4×800 relay as well as posted the fastest cross country 5k in program history…as a senior placed 11th at the 4A FHSAA state cross country championships…followed up with a fifth-place finish in the 16000 at the state finals outdoors…pursuing exercise science degree…born Sept. 20, 1994.